The extent and temporal variability of denitrification activity was measured in Yaquina Bay, Oregon, over a year using sediment cores collected approximately monthly from August 2003 through August 2004. Denitrification rates in sediments from a marine-dominated intertidal sand flat near the mouth of the estuary averaged 0.181 ± 0.114 mmol N m−2 day−1, whereas sediments within the estuary and river averaged 0.626 ± 0.141 mmol N m−2 day−1. 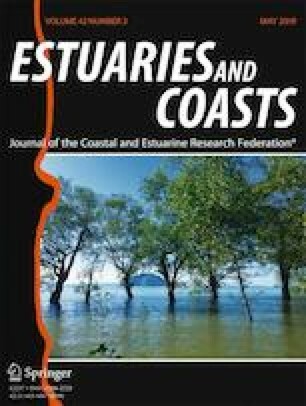 Sediments from all sites had denitrification rates throughout the year that were within the values reported for other temperate estuaries. Denitrification rates decreased with depth from 0.4 mmol N m−2 day−1 in the upper 2 to 5 cm of sediment to 0.006 mmol N m−2 day−1 at 28 cm sediment depth, indicating that denitrification was greatest in the upper 5 cm. Denitrification rates were lowest in areas with low sediment carbon content, particularly in the sandy intertidal areas at the mouth of the estuary. The results suggested that denitrification rates in this estuary were influenced by the availability of organic carbon (r2 = 0.84). Denitrification removed an estimated 8.7% of the annual Yaquina River nitrate load for August 2003 through August 2004. The relatively low percent lost via denitrification may be due to high river discharge during winter storm events when the nitrate load was greatest and dissolved nitrogen was exported directly from the estuary into the Pacific Ocean. For this reason, a direct relationship between denitrification rate and nitrate concentrations in the overlying water column was not observed. Carbon isotopic data used to investigate the carbon source indicated that δ13C increased from − 27 ‰ in the freshwater river sediments to − 21.5 ‰ δ13C at the seawater site, reflecting a change from terrestrial plant vegetation in the river to phytoplankton carbon sources at the mouth of the estuary. Similar values for δ13C between suspended and benthic sediments suggested that resuspension and mixing occurred frequently during tidal inflow. The author is grateful to the Dynamac team for river transport, C. Dudoit and R. Yarwood for assistance in the field and laboratory, and to Professor D. D. Myrold at Oregon State University for allowing the use of his laboratory for denitrification activity analyses. P. Clinton is thanked for preparing maps and providing estimates of estuarine areas. W. Hoffman and W. Frick are thanked for providing guidance on statistical analyses. Professors H. L. Phelps, J. B. Moon, and two anonymous reviewers are thanked for helpful manuscript reviews. The information in this document was funded by the U.S. Environmental Protection Agency and was reviewed by the Agency. The contents do not necessarily reflect the views of the Agency nor does mention of trade names or commercial products constitute endorsement or recommendation for use.